This story was originally written in July, 2013. Today was an unexpected kind of day. It wasn’t a day with one of our “dreamed of” locations at the end of it. It was really supposed to be a basic travel day to get us halfway to a more exciting destination the next day. We anticipated a perfectly fine but not so noteworthy day. You never know when the unexpected days will happen. We laughed; we cried. I’d give it a 9.7. The day had different chapters to it. The story line from the first part of the day was the “stages of learning” story. I am trying very hard to become a good and worthy sailor. I think (and Frank confirms this to me often) that I have come a long way. Learning to sail in mid-life is a little intimidating at times! I watch these young kids on sailboats who make it look as easy as walking. That was not the case with me, so I’m keenly aware of my progress and shortcomings, both. Somewhere around early afternoon, I started feeling like a ten year old who still can’t quite do everything for herself and has to wait for Daddy to come take care of things for her. Those who know me can only imagine how well that plays. Today it was three separate little incidents combined that got to me: 1) Pulling up anchor in Cuttyhunk, 2) Taking my shift on the way to Vineyard Haven, and 3) Anchoring at our destination. I’ll try to summarize the three “moments” as best I can. Moment #1 – Pulling up anchor in Cuttyhunk. Picture this: Very tight, crowded anchorage/mooring field. Frank is on the bow pulling up anchor meaning I am at the wheel handling the boat. In most circumstances, no problem – I do that all the time. But this was VERY tight quarters with very shallow water behind us and lots of boats in front of us. Are my boat handling skills up to snuff for this? That’s a question in both of our minds and neither of us is sure of the answer. How did it play out? Frank got the anchor up in record time and ran to the wheel before we could find out. He’s the person in charge of our health, well-being and resources: I’d do the same thing in his shoes. But I didn’t get to find out if I could handle the situation. Moment #2 – I’m “on the wheel” underway when I spot some potential shallow water coming up on the chart and am inclined to want to steer away from, but it is on the route that Frank has plotted for us on the GPS and it doesn’t go beyond a depth the boat can handle. I was basically thinking out loud about it. Frank (again – the person ultimately responsible for all things ending well at the end of the day) walks over, changes our course and problem solved. Problem is, I wanted to solve the problem, not have the problem solved for me. But I was unsure and a call had to be made. Moment #3 – Anchoring outside of Vineyard Haven. Next chapter of the day: A very hot afternoon in Vineyard Haven. We went ashore, it was hot, we walked around for an hour, bought a few groceries, had ice cream and came back. End of chapter. The most wonderful and unexpected part of the day: 4pm – 10:pm. That is probably the most relaxed 6 hours we’ve had on the boat since we started. It was hot everywhere else, but the most comfortable spot was out in the anchorage with a slight breeze blowing in over the water. I think that is the most still and content we’ve been in a long time. The first part of the afternoon was us being absorbed in our own worlds doing research about our upcoming stops or reading. Then it was grilling T-bone steaks and having dinner up top. Understand – cockpit time (while not underway) is precious. Really good cockpit time requires a certain temperature range, bug infestation range and humidity range to be comfortable, and we haven’t had a lot of really good cockpit days. There was lots to watch up there . . . ferries coming and going about every half hour, schooners, magnificent yachts cruising into the area, small boats zipping all around, sailboats with families . . . you name it. It was so cool just being observers of all the outer harbor activity. 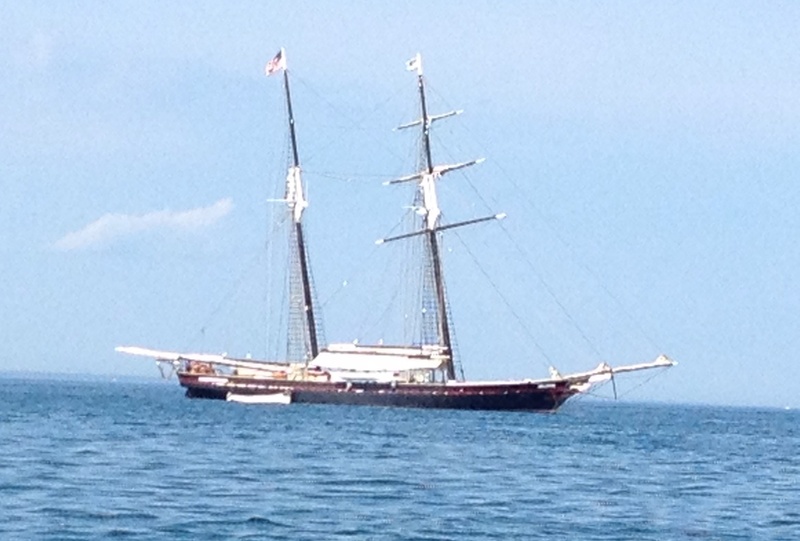 There was one very large sailing vessel that ended up anchored not far from us. We had seen it in the harbor earlier and discovered that it hosted youth camps. It was clear that was the case on this day. At anchor in the late afternoon, young knucklehead boys (a term of endearment here) were jumping off and swimming around the boat. They were having the time of their lives. Later it got quieter and you could tell they were into dinner preparations. When I tell you the vessel looked like an old fashioned pirate ship, I’m not kidding. Then at sunset, they set off a very loud canon. Young boys at a camp with explosives involved . . they had to be in heaven! (Note to self: we have GOT to remember that, in these parts, the canon at sunset is a big tradition, so be ready!) And then there was the red sky of sunset . . . and then the bright half moon in the sky and a couple of planets making appearances… and then constellations starting to join the party. Later we heard some unified chanting in the distance. Mind you, we couldn’t catch any of this very clearly – it was just floating in and out with the breeze – but it sounded like the “pirate ship” was having some type of group gathering. If you could have a campfire on a boat, they would have been sitting around it. How cool for those boys? As it got very dark, I was looking for their anchor light to come on. I saw a couple of distant flickering glows. Frank explained that boats from the “olden days” would put lanterns in the rigging – and sure enough, you could tell that’s what they had . . . lanterns serving as their anchor lights. It was an actual flame flickering in the night. The sounds from the boat got quieter and quieter. Frank speculated that, as in older boats of that kind, the “quarters” were made up of hammocks hanging down below which is quite a smart way of not rocking so much while sleeping. We pictured rows of hammocks with the boys lined up in them drifting off in stages after whispering among themselves, or falling fast asleep from being that really good tired from a full day of sun, swimming and activity. Somehow, that sight of the lanterns in the rigging and the feeling of campers settling in their bunks put us in a “stories around the campfire” kind of mood ourselves. And I have to confess – that isn’t necessarily something that happens with us very often. We’re reading or writing or fixing something or playing cards, but not as often just sitting and talking about . . . whatever. It led to topics like “Did you ever go to camp when you were little?” . . . to how much we miss our fathers and the difference in the pain of losing a parent after 19 years vs. after 50 years . . . to who knows what else. All of this was done without any music playing in the background. For us, that’s unheard of – we ALWAYS have music on in the background. It was a day that just didn’t need it because it had enough of its own soundtrack. It wasn’t until about 9:00 that we turned on a playlist full of Crosby, Stills, Nash and Young, James Taylor, Neil Young . . . perfect for the mood and the moment. And so it wasn’t until 10:00pm – late for us (well, for sure for Frank) that we went down below. We just watched life go by and stayed cool and reminisced and observed and dreamed for 6 hours straight in the cockpit of our floating home. And so we finished what we expected to be a “nothing too significant” kind of day. We had worked through a mid-learning (mid-life) mini meltdown early in the day. We had made our way to new and uncharted territories. And then we sat still and quiet long enough to truly soak up a summer night in all its glory. The day was a microcosm of “stuff.” And it wasn’t supposed to be any kind of special day when we started it. Sometimes exceptional days are exceptional for the most surprising reasons . . . and when you least expect them. I can relate! More than you know! Have had days like that – although never on a boat. They’re all too rare and wonderful. Thanks for the story – made my day. I’m enjoying your trip log immensely. For someone who suffers from seasickness it’s a great way to experience a sailing venture. Best regards to you and Frank. Thanks Kathi! Miss singing with you!